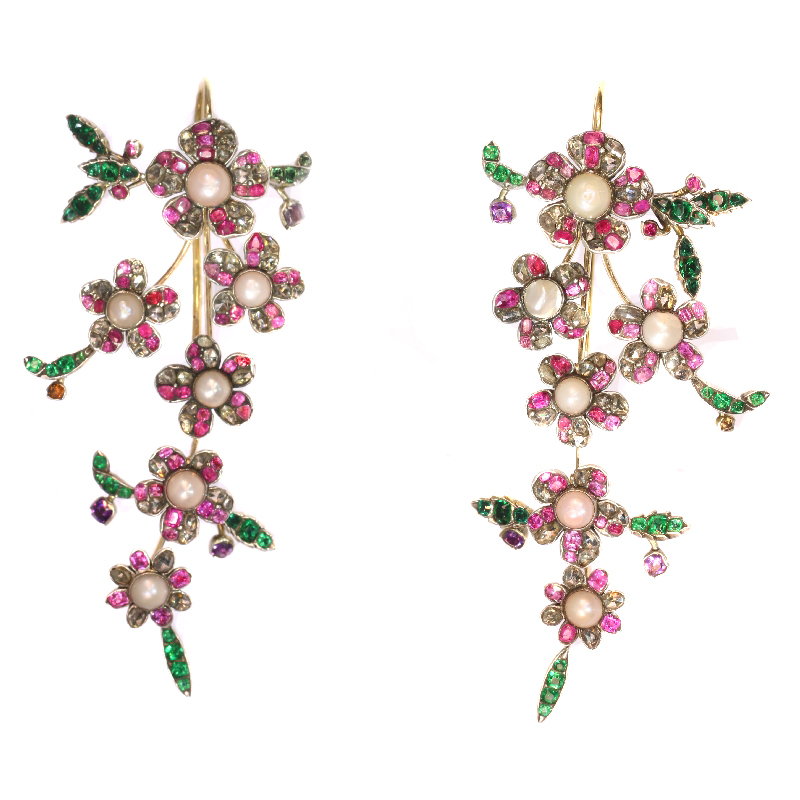 Extravagant long pendent earrings from antique parts diamonds, pearls, rubies: Description by Adin Antique Jewelry. Some time ago, a parcel of 18th century bits and pieces set with diamonds, rubies and other colour gemstones was offered to us. The owner told us that he had taken these pieces from an old 18th century clock that was broken beyond repair. We immediately fell in love with these well fabricated jewellery parts and we decided to purchase them. During a fun playtime in the workshop, many designs passed our workbenches imagining what we could do with our newly found toys while still respecting their age and style. Finally we decided to craft the chosen design with these earrings as the result. Without going into technical detail too much, we've constructed a supporting frame in 18K yellow gold with special hinges that are able to move without being of nuisance while wearing. We succeeded in our attempt to make this pair as we think it would carry the approval of the original maker of the quality bits and pieces. Style: Rococo - Rococo (less commonly roccoco) also referred to as "Late Baroque" is an 18th century style which developed as Baroque artists gave up their symmetry and became increasingly more ornate, florid, and playful. Rococo rooms were designed as total works of art with elegant and ornate furniture, small sculptures, ornamental mirrors, and tapestry complementing architecture, reliefs, and wall paintings. It was largely supplanted by the Neoclassic style. In 1835 the Dictionary of the French Academy stated that the word Rococo "usually covers the kind of ornament, style and design associated with Louis XV's reign and the beginning of that of Louis XVI". It includes therefore, all types of art produced around the middle of the 18th century in France. Diamond(s): 98 rose cut diamonds. We do not have the weight of the diamonds which is normal in our trade when it comes to rose cuts. Birthstones: Diamond is the birthstone (or month stone) for April, ruby for July and emerald for May.